مریخ‌نورد کنجکاوی در ۶ اوت ۲۰۱۲ در نزدیکی پایگاه کوه ائولیس (یا «کوه شارپ») فرود آمد. کوه ائولیس، همچنین غیررسمی به عنوان کوه شارپ شناخته می شود، یک کوه در مریخ است که در مرکز گودال گیل سربرافراشته است. ارتفاع این کوه از کف گودال گیل بیش از ۵.۵ کیلومتر است. For the mountain in Antarctica, see Mount Sharp (Antarctica). The rover Curiosity landed on August 6, 2012, near the base of Aeolis Mons. Mount Sharp, officially Aeolis Mons (IPA: [ˈiːəlɨs ˈmɒnz]), is a mountain on Mars. 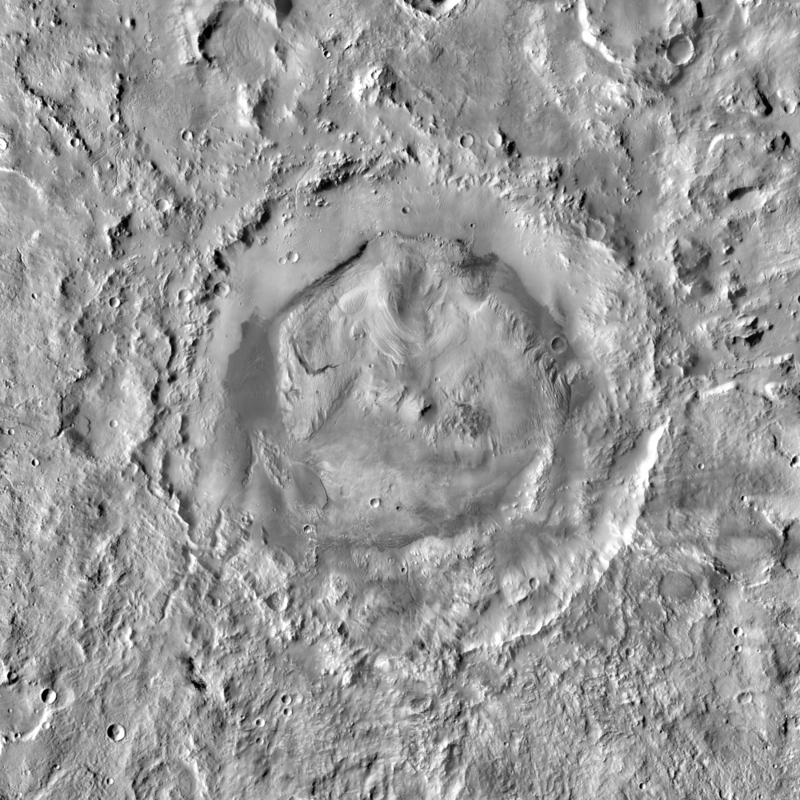 It forms the central peak within Gale crater and is located around 5°05′S 137°51′E﻿ / ﻿5.08°S 137.85°E﻿ / -5.08; 137.85, rising 5.5 km (18,000 ft) high from the valley floor. It has the ID of 15,000 in the Gazetteer of Planetary Nomenclature from the US Geological Survey. On August 6, 2012, Curiosity (the Mars Science Laboratory rover) landed in "Yellowknife" Quad 51 of Aeolis Palus, next to the mountain. NASA named the landing site Bradbury Landing on August 22, 2012. Aeolis Mons is a primary goal for scientific study. On June 5, 2013, NASA announced that Curiosity would begin an 8 km (5.0 mi) journey from the Glenelg area to the base of Aeolis Mons. On November 13, 2013, NASA announced that an entryway Curiosity would traverse on its way to Aeolis Mons was to be named "Murray Buttes", in honor of planetary scientist Bruce C. Murray (1931–2013). The trip was expected to take about a year and would include stops along the way to study the local terrain. On September 11, 2014, NASA announced that the Curiosity rover had reached Aeolis Mons, the rover mission's long-term prime destination. On October 5, 2015, possible recurrent slope lineae, wet brine flows, were reported on Mount Sharp near Curiosity. On June 1, 2017, NASA reported that an ancient striated lake had existed in Gale crater that could have been favorable for microbial life. The mountain appears to be an enormous mound of eroded sedimentary layers sitting on the central peak of Gale. It rises 5.5 km (18,000 ft) above the northern crater floor and 4.5 km (15,000 ft) above the southern crater floor, higher than the southern crater rim. The sediments may have been laid down over an interval of 2 billion years, and may have once completely filled the crater. Some of the lower sediment layers may have originally been deposited on a lake bed, while observations of possibly cross-bedded strata in the upper mound suggest aeolian processes. However, this issue is debated, and the origin of the lower layers remains unclear. If katabatic wind deposition played the predominant role in the emplacement of the sediments, as suggested by reported 3 degree radial slopes of the mound's layers, erosion would have come into play largely to place an upper limit on the mound's growth. On December 8, 2014, a panel of NASA scientists discussed (archive 62:03) the latest observations of Curiosity about how water may have helped shape the landscape of Mars, including Aeolis Mons, and had a climate long ago that could have produced long-lasting lakes at many Martian locations. On October 8, 2015, NASA confirmed that lakes and streams existed in Gale crater 3.3 - 3.8 billion years ago delivering sediments to build up the lower layers of Mount Sharp. On February 1, 2019, NASA scientists reported that the Mars Curiosity rover determined, for the first time, the density of Mount Sharp in Gale crater, thereby establishing a clearer understanding of how the mountain was formed. Mons Hadley, on the Moon, is 4.5 km (15,000 ft) high. Aeolis Mons is 5.5 km (18,000 ft) high, about the same height as Mons Huygens, the tallest lunar mountain, and taller than Mons Hadley visited by Apollo 15. The tallest mountain known in the Solar System is in Rheasilvia crater on the asteroid Vesta, which contains a central mound that rises 22 km (14 mi; 72,000 ft) high; Olympus Mons on Mars is nearly the same height, at 21.9 km (13.6 mi; 72,000 ft) high. In comparison, Mount Everest rises to 8.8 km (29,000 ft) altitude above sea level (asl), but is only 4.6 km (15,000 ft) (base-to-peak) (btp). Africa's Mount Kilimanjaro is about 5.9 km (19,000 ft) altitude above sea level to the Uhuru peak; also 4.6 km base-to-peak. America's Denali, also known as Mount McKinley, has a base-to-peak of 5.5 km (18,000 ft). The Franco-Italian Mont Blanc/Monte Bianco is 4.8 km (16,000 ft) in altitude above sea level, Mount Fuji, which overlooks Tokyo, Japan, is about 3.8 km (12,000 ft) altitude. Compared to the Andes, Aeolis Mons would rank outside the hundred tallest peaks, being roughly the same height as Argentina's Cerro Pajonal; the peak is higher than any above sea level in Oceania, but base-to peak it is considerably shorter than Hawaii's Mauna Kea and its neighbors. Discovered in the 1970s, the mountain remained unnamed for several decades. When Gale crater became a candidate landing site, the mountain was given various labels e.g. 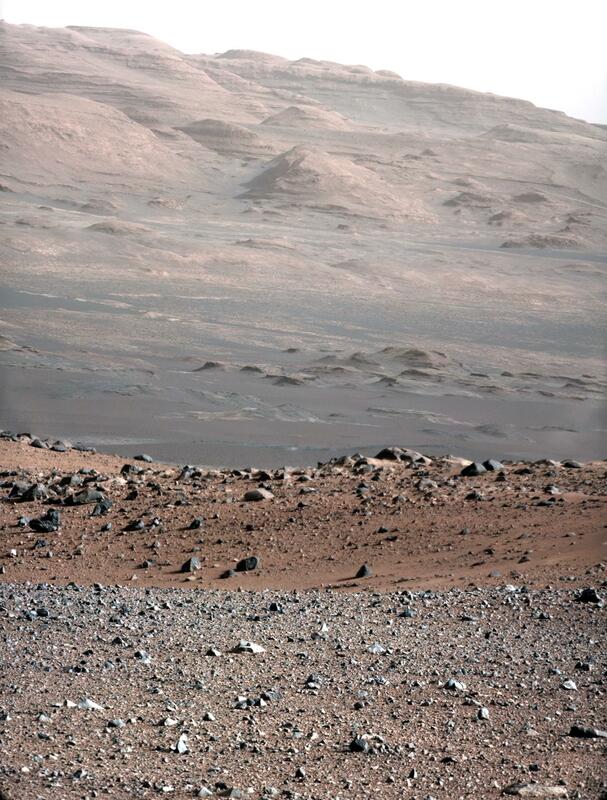 in 2010 a NASA photo caption called it "Gale crater mound". In March 2012, NASA unofficially named it "Mount Sharp", after American geologist Robert P. Sharp. Comparison of Mount Sharp (Aeolis Mons) to the sizes of three large mountains on Earth. Since 1919 the International Astronomical Union (IAU) has been the official body responsible for planetary nomenclature. Under its long-established rules for naming features on Mars, mountains are named after the Classical albedo feature in which they are located, not after people. In May 2012 the IAU officially named the mountain Aeolis Mons after the Aeolis albedo feature. It also gave the name Aeolis Palus to the plain located on the crater floor between the northern wall of Gale and the northern foothills of the mountain. The IAU's choice of name is supported by the United States Geological Survey. Martian craters are named after deceased scientists, so in recognition of NASA and Sharp, at the same time the IAU named "Robert Sharp", a large (150 km (93 mi) diameter), crater located about 260 km (160 mi) west of Gale. NASA and the European Space Agency continue to refer to the mountain as "Mount Sharp" in press conferences and press releases. This is similar to their use of other informal names, such as the Columbia Hills near one of the Mars Exploration Rover landing sites. In August 2012, the magazine Sky & Telescope ran an article explaining the rationale of the two names and held an informal poll to determine which one was preferred by their readers. Over 2700 people voted, with Aeolis Mons winning by 57% to Mount Sharp's 43%. On December 16, 2014, NASA reported detecting, based on measurements by the Curiosity rover, an unusual increase, then decrease, in the amounts of methane in the atmosphere of the planet Mars; as well as, detecting Martian organic chemicals in powder drilled from a rock by the Curiosity rover. Also, based on deuterium to hydrogen ratio studies, much of the water at Gale Crater on Mars was found to have been lost during ancient times, before the lakebed in the crater was formed; afterwards, large amounts of water continued to be lost. On June 1, 2017, NASA reported that the Curiosity rover provided evidence of an ancient lake in Gale crater on Mars that could have been favorable for microbial life; the ancient lake was stratified, with shallows rich in oxidants and depths poor in oxidants; and, the ancient lake provided many different types of microbe-friendly environments at the same time. NASA further reported that the Curiosity rover will continue to explore higher and younger layers of Mount Sharp in order to determine how the lake environment in ancient times on Mars became the drier environment in more modern times. On April 11, 2019, NASA announced that the Curiosity rover on the planet Mars drilled into, and closely studied, a "clay-bearing unit" which, according to the rover Project Manager, is a "major milestone" in Curiosity's journey up Mount Sharp. Curiosity drilled into a "clay-bearing unit". Self-portrait of the Curiosity rover at the Mojave site (January 31, 2015). As of April 19, 2019, Curiosity has been on the planet Mars for 2382 sols (2447 total days; 6 years, 256 days) since landing on August 6, 2012. Since September 11, 2014, Curiosity has been exploring the slopes of Mount Sharp, where more information about the history of Mars is expected to be found. As of late January 2019, the rover has traveled over 20.05 km (12.46 mi) and climbed over 327 m (1,073 ft) in elevation to, and around, the mountain base since landing at "Bradbury Landing" in August 2012. The Curiosity rover is exploring the slopes of Mount Sharp. Location map - Curiosity rover at the base of Mount Sharp - as viewed from Space (MRO; HiRISE; January 28, 2019/Sol 2302). (MRO; HiRISE; December 13, 2014). Curiosity rover (center bright blue) on Mount Sharp viewed from space (MRO; HiRISE; June 5, 2017). Overview map - blue oval marks "Base of Aeolis Mons" (August 17, 2012). Traverse map - route from Landing to slopes on Aeolis Mons (September 11, 2014). Close-up Map - new route (yellow) - Aeolis Mons slopes (September 11, 2014). Close-up map - Aeolis Mons slopes - with few craters (bottom) (September 11, 2014). Geology map - Aeolis Mons slopes (September 11, 2014). 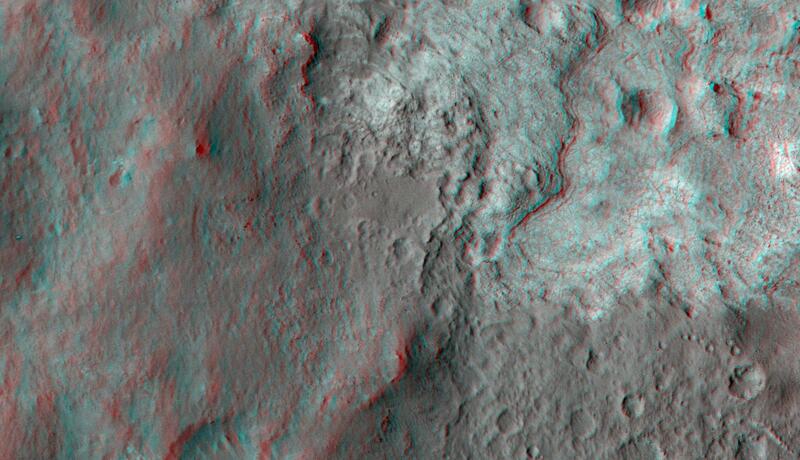 "Murray Buttes" knobs - Aeolis Mons slopes (November 13, 2013). "Murray Buttes" mesa - Aeolis Mons slopes (September 11, 2014). "Murray Formation" bands - Aeolis Mons slopes (September 11, 2014). "Pahrump Hills" - Notable places at base of Aeolis Mons (Autumn, 2014). "Pahrump Hills" sand - viewed by Curiosity (November 13, 2014). "Pahrump Hills" sand - Curiosity's tracks (November 7, 2014). "Pahrump Hills" rock outcrop on Mars – viewed by Curiosity (September 23, 2014). 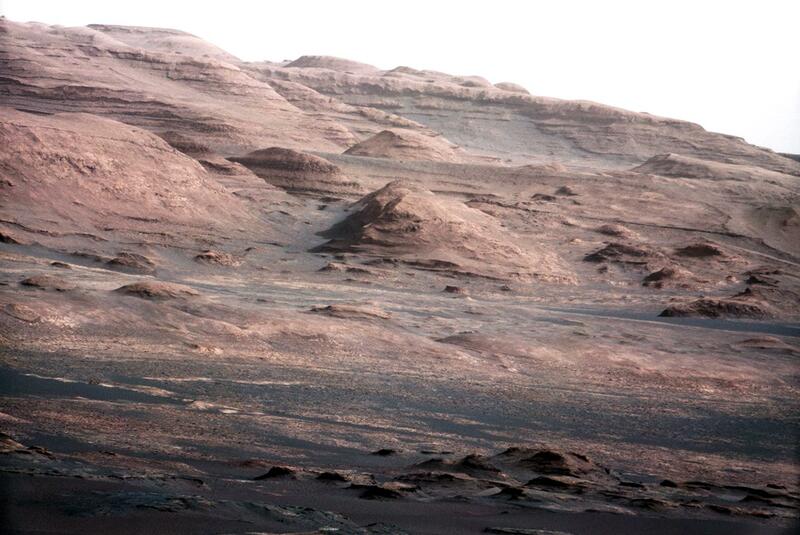 "Confidence Hills" rock on Mars - Curiosity's 1st target at Aeolis Mons (September 24, 2014). "Pahrump Hills" bedrock on Mars - viewed by Curiosity (November 9, 2014). "Pink Cliffs" rock outcrop on Mars - viewed by Curiosity (October 7, 2014). "Alexander Hills" bedrock on Mars - viewed by Curiosity (November 23, 2014). Ancient Lake fills Gale Crater on Mars (simulated view). (September 11, 2014; white balanced). Gale crater with Aeolis Mons rising from the center. Curiosity's landing area (marked) is in Aeolis Palus. Aeolis Mons rises from the middle of Gale - Green dot marks Curiosity's landing site in Aeolis Palus. Gale crater with Curiosity's landing area within Aeolis Palus noted - north is down. Aeolis Mons may have formed from the erosion of sediment layers that once filled Gale. Curiosity's landing site (green dot) - blue dot marks Glenelg Intrigue - blue spot marks the base of Mount Sharp - a planned area of study. Curiosity's landing site - "Quad Map" includes "Yellowknife" Quad 51 of Aeolis Palus in Gale. Curiosity's landing site - "Yellowknife" Quad 51 (1-mi-by-1-mi) of Aeolis Palus in Gale. Comparison of color versions (raw, natural, white balance) of Aeolis Mons (August 23, 2012). Aeolis Mons as viewed by Curiosity (August 8, 2012) (white balanced image). Layers at the base of Aeolis Mons - dark rock in inset is same size as Curiosity (white balanced image). Curiosity's wheels - Aeolis Mons is in the background (MAHLI, September 9, 2012). First-Year and First-Mile Traverse Map of the Curiosity rover on Mars (August 1, 2013) (3-D). Curiosity's view of "Mount Sharp" (September 20, 2012; white balanced) (raw color). Curiosity's view of the "Rocknest" area – South is center/North at both ends; "Mount Sharp" at SE horizon (somewhat left-of-center); "Glenelg" at East (left-of-center); rover tracks at West (right-of-center) (November 16, 2012; white balanced) (raw color) (interactives). Curiosity's view near "Logan Pass" on the slopes of "Mount Sharp" (May 10, 2015; white balanced image). Curiosity's view of "Mount Sharp" (September 9, 2015). Curiosity's view of Mars sky at sunset (February 2013; sun simulated by artist). ^ a b c ""Mount Sharp" on Mars Compared to Three Big Mountains on Earth". NASA. March 27, 2012. Retrieved March 31, 2012. ^ NASA Staff (August 10, 2012). "Curiosity's Quad – IMAGE". NASA. Retrieved August 11, 2012. ^ NASA Staff (August 6, 2012). "NASA Lands Car-Size Rover Beside Martian Mountain". NASA. Retrieved August 6, 2012. ^ NASA Staff (August 6, 2012). "NASA Lands Car-Size Rover Beside Martian Mountain". NASA/JPL. Retrieved August 7, 2012. ^ a b Webster, Guy; Brown, Dwayne (November 13, 2013). "Mars Rover Teams Dub Sites In Memory of Bruce Murray". NASA. Retrieved November 14, 2013. ^ a b Chang, Alicia (June 5, 2013). "Curiosity rover to head toward Mars mountain soon". AP News. Retrieved June 7, 2013. ^ a b Chang, Kenneth (June 7, 2013). "Martian Rock Another Clue to a Once Water-Rich Planet". New York Times. Retrieved June 7, 2013. ^ a b c Webster, Guy; Agle, DC; Brown, Dwayne (September 11, 2014). "NASA's Mars Curiosity Rover Arrives at Martian Mountain". NASA. Retrieved September 10, 2014. ^ a b c Chang, Kenneth (September 11, 2014). "After a Two-Year Trek, NASA's Mars Rover Reaches Its Mountain Lab". New York Times. Retrieved September 12, 2014. ^ Chang, Kenneth (5 October 2015). "Mars Is Pretty Clean. Her Job at NASA Is to Keep It That Way". New York Times. Retrieved 6 October 2015. ^ a b Webster, Guy; Mullane, Laura; Cantillo, Laurie; Brown, Dwayne (May 31, 2017). "High-Silica 'Halos' Shed Light on Wet Ancient Mars". NASA. Retrieved June 1, 2017. ^ a b Webster, Guy; Filiano, Gregory; Perkins, Robert; Cantillo, Laurie; Brown, Dwayne (June 1, 2017). "Curiosity Peels Back Layers on Ancient Martian Lake". NASA. Retrieved June 1, 2017. ^ a b Hurowitz, J.A. ; et al. (June 2, 2017). "Redox stratification of an ancient lake in Gale crater, Mars". Science. 356 (6341): eaah6849. Bibcode:2017Sci...356.6849H. doi:10.1126/science.aah6849. PMID 28572336. Retrieved June 3, 2017. ^ a b "Gale Crater's History Book". Arizona State University. Retrieved December 7, 2012. ^ a b Anderson, R. B.; Bell III, J. F. (2010). "Geologic mapping and characterization of Gale Crater and implications for its potential as a Mars Science Laboratory landing site". International Journal of Mars Science and Exploration. 5: 76–128. Bibcode:2010IJMSE...5...76A. doi:10.1555/mars.2010.0004. ^ Cabrol, N. A.; et al. (1999). "Hydrogeologic evolution of Gale Crater and its relevance in the exobiological exploration of Mars" (PDF). Icarus. 139 (2): 235–245. Bibcode:1999Icar..139..235C. doi:10.1006/icar.1999.6099. Archived from the original (PDF) on October 29, 2013. ^ Irwin, R. P.; Howard, A. D.; Craddock, R. A.; Moore, J. M. (2005). "An intense terminal epoch of widespread fluvial activity on early Mars: 2. Increased runoff and paleolake development". Journal of Geophysical Research. 110 (E12): E12S15. Bibcode:2005JGRE..11012S15I. doi:10.1029/2005JE002460. ^ Wall, M. (May 6, 2013). "Bizarre Mars Mountain Possibly Built by Wind, Not Water". Space.com. Retrieved May 13, 2013. ^ Kite, E. S.; Lewis, K. W.; Lamb, M. P.; Newman, C. E.; Richardson, M. I. (2013). "Growth and form of the mound in Gale Crater, Mars: Slope wind enhanced erosion and transport". Geology. 41 (5): 543–546. arXiv:1205.6840. Bibcode:2013Geo....41..543K. doi:10.1130/G33909.1. ISSN 0091-7613. ^ Brown, Dwayne; Webster, Guy (December 8, 2014). "Release 14-326 – NASA's Curiosity Rover Finds Clues to How Water Helped Shape Martian Landscape". NASA. Retrieved December 8, 2014. ^ Kaufmann, Marc (December 8, 2014). "(Stronger) Signs of Life on Mars". New York Times. Retrieved December 8, 2014. ^ Chang, Kenneth (December 8, 2014). "Curiosity Rover's Quest for Clues on Mars". New York Times. Retrieved December 9, 2014. ^ Clavin, Whitney (October 8, 2015). "NASA's Curiosity Rover Team Confirms Ancient Lakes on Mars". NASA. Retrieved October 9, 2015. ^ Grotzinger, J.P.; et al. (October 9, 2015). "Deposition, exhumation, and paleoclimate of an ancient lake deposit, Gale crater, Mars". Science. 350 (6257): aac7575. Bibcode:2015Sci...350.7575G. doi:10.1126/science.aac7575. PMID 26450214. Retrieved October 9, 2015. ^ Chang, Kenneth (31 January 2019). "How NASA's Curiosity Rover Weighed a Mountain on Mars - With a bit of technical improvisation, scientists worked out that the bedrock of Mount Sharp appeared to be less dense than had been expected". The New York Times. Retrieved 1 February 2019. ^ Lewis, Kevin W. (1 February 2019). "A surface gravity traverse on Mars indicates low bedrock density at Gale crater". Science. 363 (6426): 535–537. doi:10.1126/science.aat0738. PMID 30705193. Retrieved 1 February 2019. ^ Fred W. Price (1988). The Moon observer's handbook. London: Cambridge University Press. ISBN 978-0-521-33500-3. ^ "Kilimajaro Guide—Kilimanjaro 2010 Precise Height Measurement Expedition". Retrieved May 16, 2009. ^ "Mont Blanc shrinks by 45cm in two years". Sydney Morning Herald. November 6, 2009. ^ a b "Mount Sharp or Aeolis Mons?". Sky & Telescope. August 14, 2012. Retrieved August 18, 2012. ^ Space.com staff (March 29, 2012). "NASA's New Mars Rover Will Explore Towering "Mount Sharp"". Space.com. Retrieved March 30, 2012. ^ a b Blue, J. (May 16, 2012). "Three New Names Approved for Features on Mars". US Geological Survey. Archived from the original on July 28, 2012. Retrieved May 28, 2012. ^ Agle, D. C. (March 28, 2012). "'Mount Sharp' On Mars Links Geology's Past and Future". NASA. Retrieved March 31, 2012. ^ Chang, Kenneth (December 16, 2014). "'A Great Moment': Rover Finds Clue That Mars May Harbor Life". New York Times. Retrieved December 16, 2014. ^ Mahaffy, P.R. ; et al. (December 16, 2014). "Mars Atmosphere – The imprint of atmospheric evolution in the D/H of Hesperian clay minerals on Mars". Science. 347 (6220): 412–414. Bibcode:2015Sci...347..412M. doi:10.1126/science.1260291. PMID 25515119. Retrieved December 16, 2014. ^ Webster, Guy; Cantillo, Laurie; Brown, Dwayne (August 2, 2017). "Five Years Ago and 154 Million Miles Away: Touchdown!". NASA. Retrieved August 8, 2017. ^ Wall, Mike (August 5, 2017). "After 5 Years on Mars, NASA's Curiosity Rover Is Still Making Big Discoveries". Space.com. Retrieved August 8, 2017. ^ a b Good, Andrew (11 April 2019). "Curiosity Tastes First Sample in 'Clay-Bearing Unit'". NASA. Retrieved 12 April 2019. ^ Webster, Guy (August 6, 2013). "Mars Curiosity Landing: Relive the Excitement". NASA. Retrieved August 7, 2013. ^ a b Staff (January 19, 2017). "PIA17355: Curiosity's Progress on Route from 'Glenelg' to Mount Sharp". NASA. Retrieved January 22, 2017. ^ a b Staff (December 13, 2016). "PIA21145: Curiosity Rover's Martian Mission, Exaggerated Cross Section". NASA. Retrieved December 15, 2016. ^ Staff (January 30, 2018). "Wide-Angle Panorama from Ridge in Mars' Gale Crater". NASA. Retrieved January 31, 2018. ^ Chang, Kenneth (June 22, 2017). "High Above Mars, a NASA Orbiter Spies the Curiosity Rover". NASA. Retrieved June 23, 2017. Jürgen Blunck – Mars and its Satellites, A Detailed Commentary on the Nomenclature, 2nd edition. 1982. Wikimedia Commons has media related to Aeolis Mons. Look up Aeolis Mons in Wiktionary, the free dictionary. Google Mars scrollable map – centered on Aeolis Mons. این صفحه آخرین‌بار در ‏۲۱ دسامبر ۲۰۱۸ ساعت ‏۰۳:۰۷ ویرایش شده‌است.